Sorry for the lack of posts, I was sick last week. (Boo!) I'm still not quite all back yet either. Anyway, Angela Liguori, a book artist from Italy, sent me these beautiful images of books published under her press: Edizioni Almenodue (a partnership between her and Silvana Amato, a graphic designer). 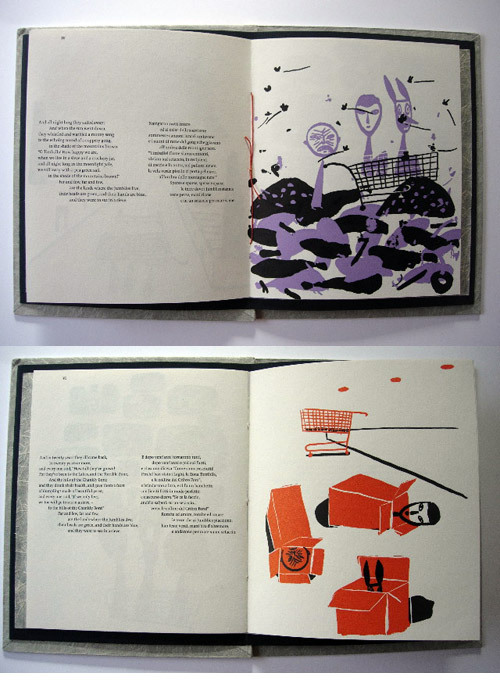 Together with Fabian Negrin's illustrations, their books feel like they're channeling the spirit of Bruno Munari. 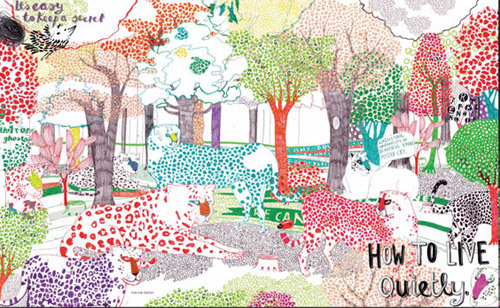 In one book, graphic illustrations are paired with poetry by Elio Pecora translated into English. In another, text by Edward Lear (1817). 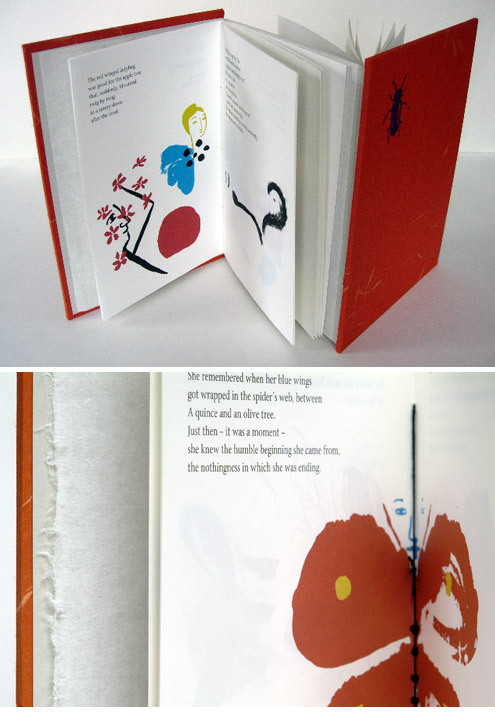 The books look perfect from the color palette and graphic illustrations to the binding and the overall composition. It's a well-executed collaborative project where you see the contribution of each member into a wonderfully orchestrated piece. If anyone lives in the Boston or Brookline area, Angela has an upcoming trunk show at POD in April and she also teaches workshops at Paper Source. (I wish I could go!) See her events page for more info. 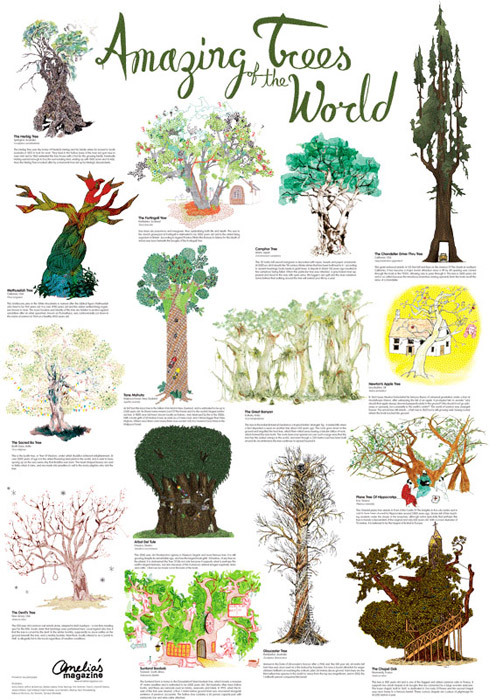 I love the graphic quality of these illustrations by local artist, Michael Bartalos. The above image is called Warionettes. And below, a letterpressed publication made in 2005 called 29 Degrees North (through San Francisco Center for the Book). Just look at the handlettering on the cover: beautiful. I'd like to see this piece close up. It's funny how blogs can connect you with people. In the preceding post on the Goodman-Sohr home, Sara Malone, a friend of and co-stylist with Genifer Goodman posted a comment. Five comments and five emails later, we've become insta-pals. Though I'm in California and she's in Nashville, we immediately realized we had a friend in common. We both know Laura Crookston Deleot, an ex-Chronicle books, Nashville-based graphic designer who recently hired me to illustrate a cookbook. The design and publishing world is so small. I guess it was just a matter of time before our paths crossed. Sara is a graphic designer by day, stylist by night (sideline gig). 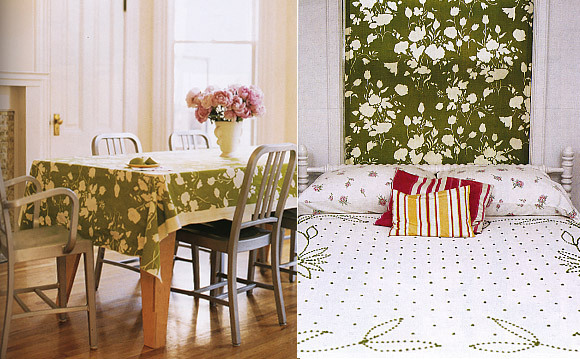 I must say that her graphic sensiblities have translated very nicely into her interior style. I love the strong lines, graphic contrasts, and chromatic boldness--it just grabs you. (You know, it's generated some ideas for my own home now.) 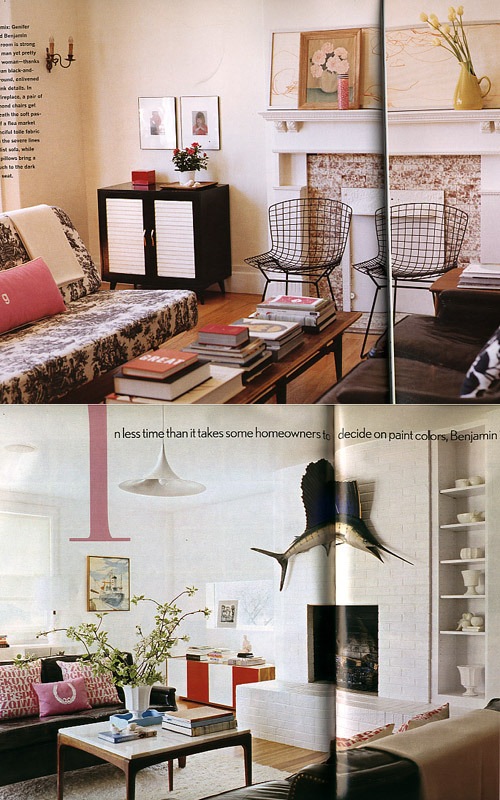 And a home that she and Genifer co-styled will be featured in the April issue of Domino as well. I can't wait to see that. Here's more images from her home. 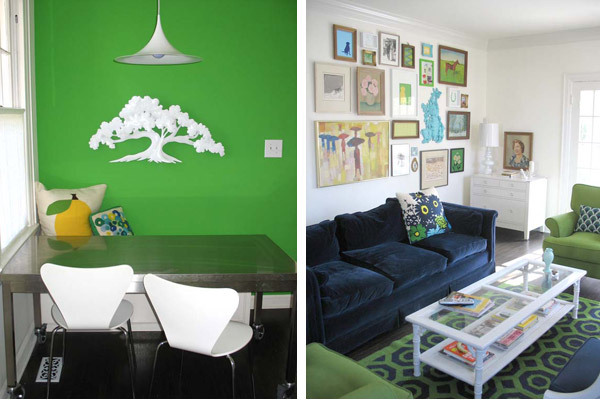 Image on the left is her breakfast nook. The right is her living room. 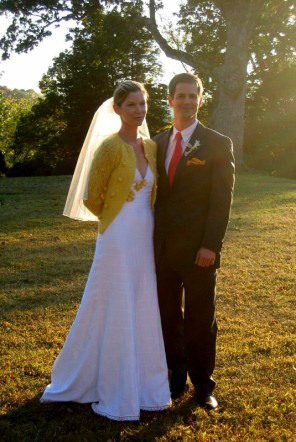 Sara also gave me a picture from Genifer's wedding which will be featured in MS Weddings. I think Lena and Genifer would get along great, certainly for their love of yellow. 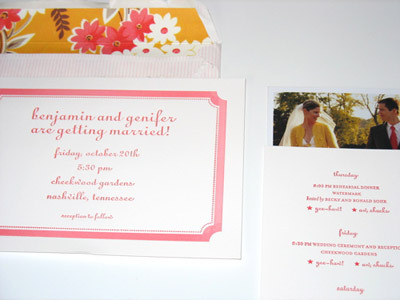 And the wedding invitations were designed by Sara, too. I can't remember someone's name five minutes after being introduced, but I can remember random details of homes published in a magazine after two years. Go figure. The brain works in mysterious ways sometimes. 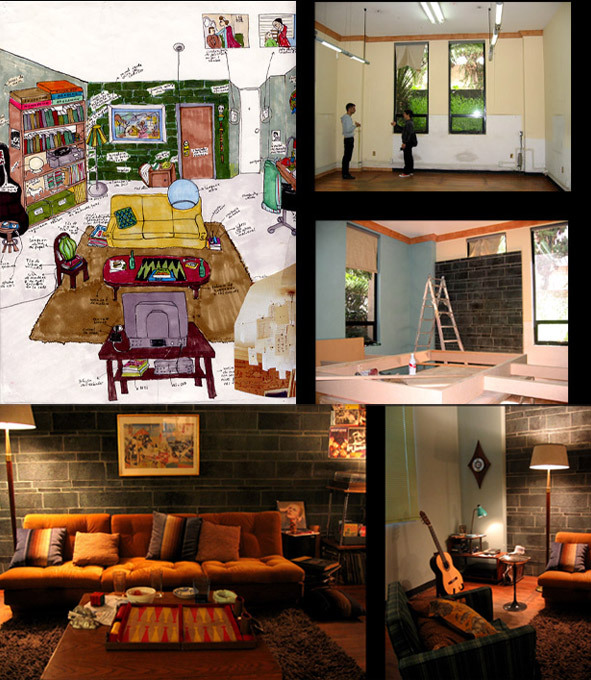 The living room in BL (top) and then in BH&G (bottom). 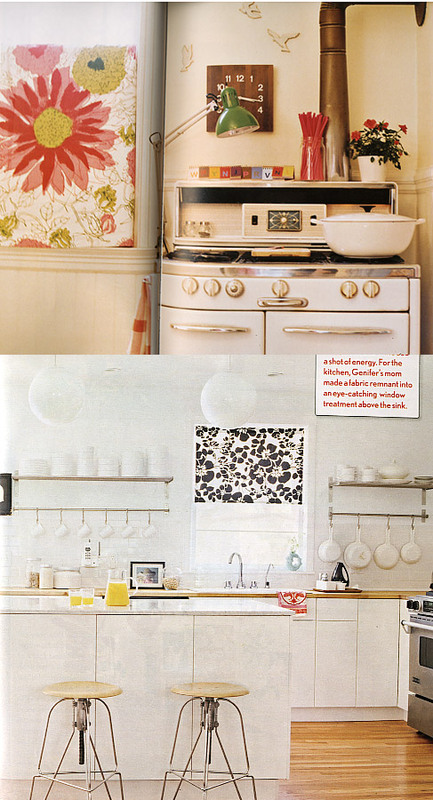 The kitchen in BL (top) and then in BH&G (bottom). I miss the vintage vibe of the original kitchen, but I'm sure the new kitchen is far more efficient. 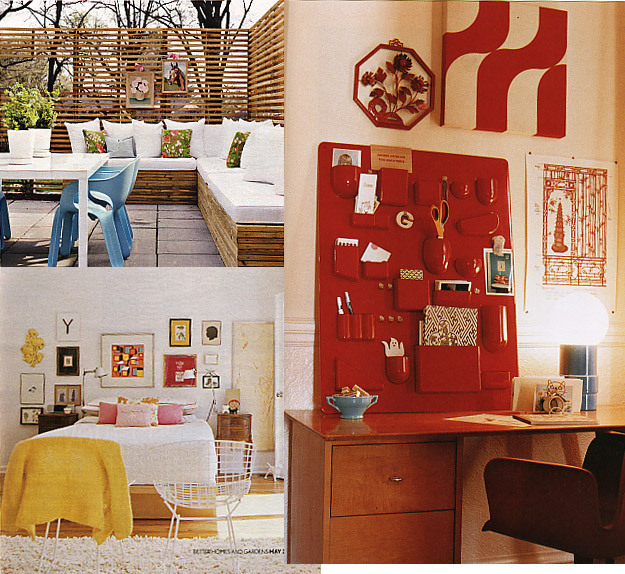 And just some of the other images I enjoyed, their bedroom and outdoor patio (in BH&G) and workspace from BL. I took part in kelly's beautiful use swap last month. I was totally prompt about mailing my package to my swap partner. But I'm a slowpoke when it comes to posting the image of the goodies I received. 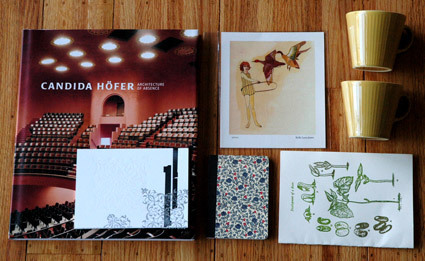 A big thank you to Jen for sending me all these wonderful pieces (especially for the Candida Hofer book and yellow cups) and making the experience worthwhile. Continuing from the previous post, here are more images from that home. 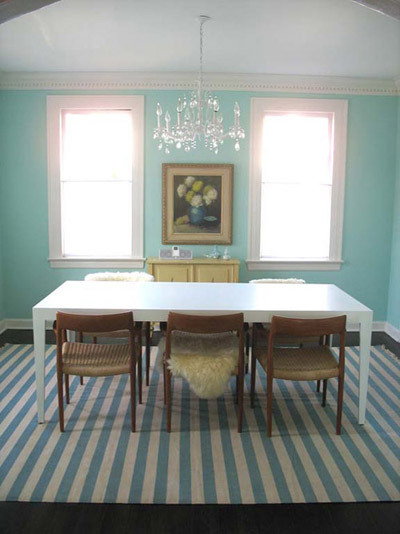 And now, I have a new favorite interior designer: Jay Jeffers. 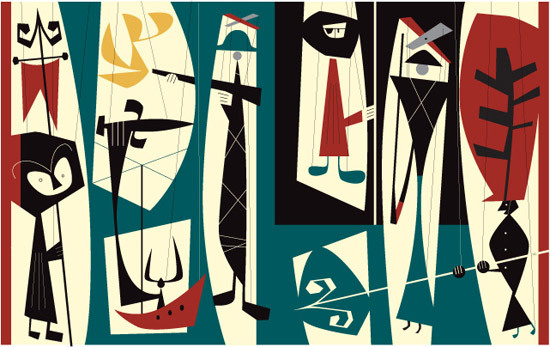 Thank you to midcenturyjo for pointing me to his website. 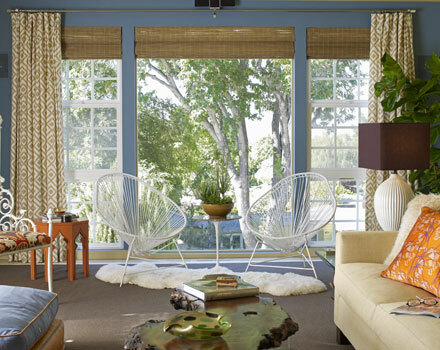 According to Jeffers: "The design for this groovy sixties house is a nod to the Palm Springs and Palm Beach styles of the era, reimagined for 21st-century living. The Los Angeles home of professional skateboarder Reese Forbes and his wife, Shawn, Jay Jeffers designed the interiors to be a chic mix of vintage and modern." 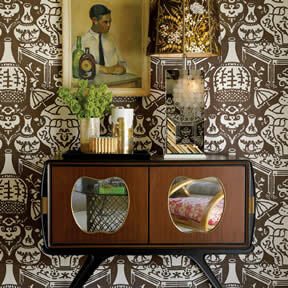 And image from the previous post is described as: "The large foyer has been transformed into a swank cocktail lounge, enveloped in a bold chinoiserie print and featuring a mid-Century 'apple' bar." The apple bar is too cute. 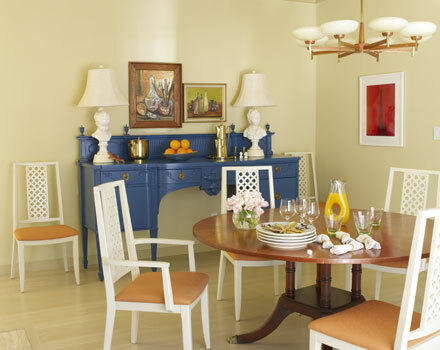 On a random visit to the California Home & Design magazine website, I came across this lovely image. 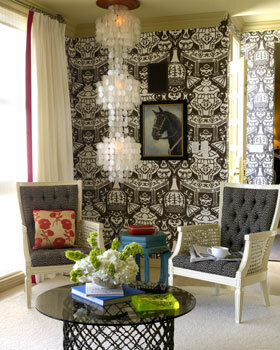 Alrighty, I need to get full sourcing on this picture from the wallpaper to the console (are those mirrors?) to the chameleon-like table lamp (Stare hard--it's almost like one of those 3-D posters). I've only read this magazine once, in a doctor's office many months ago. It didn't leave much of an impression on me, but this image certainly makes me want to reconsider and check it out again. For sure, I'll be picking up this month's issue. I have a fun game for you design nerds out there. No, not the Maharam memory game or the Eames House of Cards. I mean real inexpensive fun. It merely involves your West Elm catalog and digging in your design memory rolodex. (Mines a little disorganized, I got my G's filed under my R's.) I digress. Here's how it works: I'll show you an image from the West Elm catalog, and you think of the independent designer whose work served as the source of "inspiration". What's your guess? 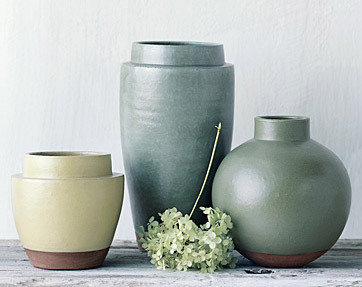 If we think alike, then yes, I immediately thought of Emigre ceramics. It seems West Elm is doing a cleaner job in appropriating artists these days. (Still the grasshopper pillow gets me.) Maybe one day they'll make something that's completely original. I know, who am I kidding. I secretly harbor a desire to be a set decorator, designer. Well...it was a secret like 5 minutes ago. It started with the Running with Scissors post, then I read Holly's post on SDSA, and then I discovered Mogollon. According to them, they are "a little powerhouse of an art direction and design studio. Mogollon means 'a chaotic abundance' in Spanish slang - and that explains just what Mogollon is." Mogollon has done some gorgeous projects. My favorite is their set design work for "Mejor es que Gabriela no se muera." (Beats me what that means.) I love that they show their set design work through the entire process from sketch to set building to final product. Figures I would like the set with the hippy Brady Bunch vibe!